This coming year, when high school girls and boys around the country travel to compete in premiere Amateur Athletic Union basketball tournaments, they will be playing on the portable wood floor that our own Wellesley Blue basketball team played on for the last 29 seasons. That’s because this spring, in preparation for the renovation of the Dorothy Towne Field House, which will boast a permanent wood floor, Wellesley was able to sell the portable floor to Eddie Ford, who owns and operates the country's oldest travel team basketball tournament. “I saw it as an opportunity to bring some money back to the [Field House renovation] project,” says Martha Dietrick, associate director of facilities and operations in Physical Education, Recreation, and Athletics (PERA). The portable floor had been well taken care of, and so she was able to negotiate a deal with Eddie Ford; she could even provide to him details of the grade maple used on the floor, since she had kept the floor’s original purchase order from 1985. In 1985, after the Field House had been renovated as part of the then-new Keohane Sports Center, PERA equipment specialist Jack Daigle and his brother Dan Daigle, who heads the architectural group in Facilities, were two of the six people charged with assembling the floor in October and then taking it up and storing it once basketball season was over. In fact, the Daigle brothers were part of the team that assembled and disassembled the portable floor every year at Wellesley—a process they described as long and difficult. The floor was big—it was broken up into close to 200 different panels. Each panel was interlocked with the next one, to ensure that it stayed in place, and originally, they had to use large mallets to hammer by hand each piece into place. In those early years, putting down the floor was a two-day process. Not only was it physically demanding work, it was critical that the floor panels lined up perfectly, especially to accommodate the poles for volleyball nets, which had an exact location on the floor. “That was a feat unto itself,” Dan Daigle said. During the portable floor’s off-season (from about March to October), it was stored in a closet inside the Field House that was built specifically to house that floor. Running the length of the Field House, the closet was big enough to hold the nearly 200 panels (or, 13 carts with 15 floor panels to a cart) that comprised the floor. In the renovated Field House, that space will be repurposed into three new meeting spaces for visiting teams. And in the renovated Field House, Wellesley’s basketball and volleyball teams will have a permanent wood floor to practice and play on. What does a permanent floor mean? It means the basketball team won’t have to go off site to practice in the fall (the portable floor was installed in October each year, after tennis and the first term of physical education classes had concluded); it means the volleyball team will have an improved practice space over the multipurpose gym; it means that Wellesley will have the ability to do a variety of recreational activities all year long; and it means that a crew is no longer needed to assemble or disassemble the floor. Unforgotten in the absence of the old parquet will be the legacy of the many women who played there including hoops notables such as Liza Janssen ’94, the team’s most outstanding all-around player; Amy and Meg Barao ’01, the only set of twins (identical) to play on the court; point guard Sarah Bay ’96, the only player (thus far) to play with hair dyed blue; Elizabeth Murphy ’86, the only Rhodes Scholar to play on the court; Jennifer Olsen ’93 and Elizabeth Senecal ’04, the only two Wellesley High School graduates to play for the Blue on the court; and Meghan Sargent ’15, who scored the last-ever Wellesley basket on the court—a layup in the last second of a game against Babson in February 2014. 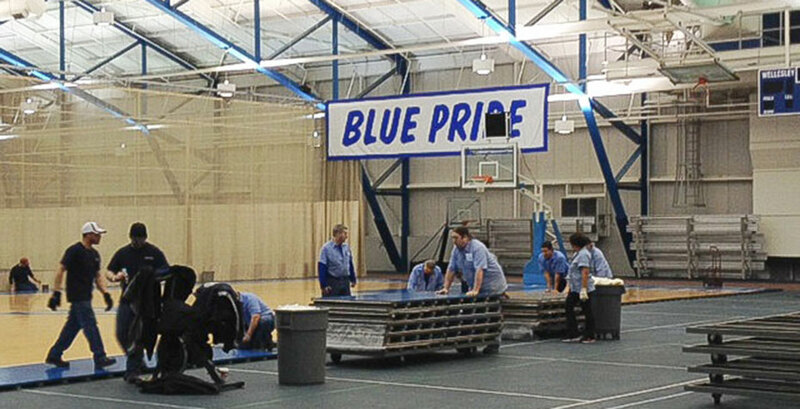 This spring, the facilities crew took apart the floor one last time. And, of course, they participated in an annual tradition of signing their names on the back of the very last panel.